" I can't find a lawyer to sue CPS for me." S.Bella Melendez . . .
False Allegation lead to the removal of child,grandchild. 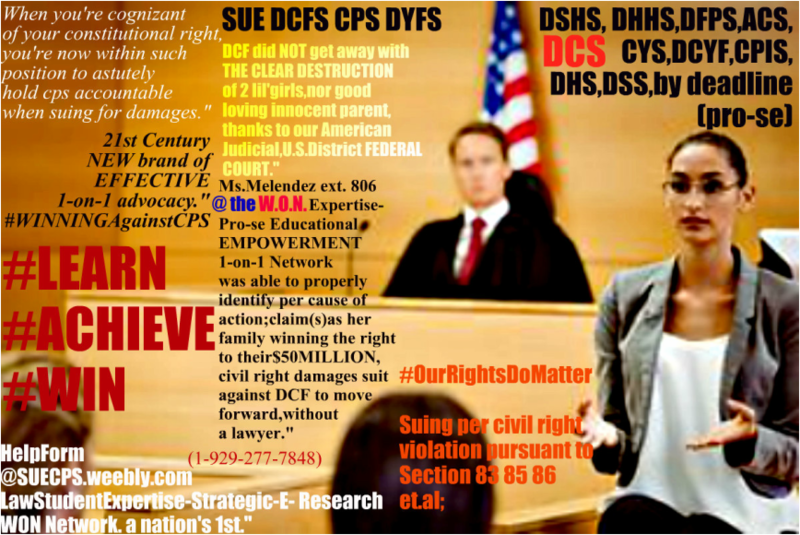 . .
Pro-se litigant,the owner MELENDEZ learned and she studied aggressively, and has proven such dexterity,insofar as suing the"right way" cps employee,in the u.s.district federal court. Media validates her win, involving her $50million in damages,winning such right to see her lawsuit approved by a FEDERAL judge,to move forward." Inspiration for many nationwide,who are being violated. Inspiration for those who prior to reaching her did not know you're able to sue timely child protection worker for the violation of one's constitutional, civil rights." civil rights money damages: civil right per claim;cause of action against abhorrent workers at D.H.H.S. move forward $50 million in damages,for child(2 girls)and doting educated mom. She made her inquest,and had no idea it was yes,OUR STAFF LEADER. "I've found my help,to sue pro-se"
before deadline,premise on she did not learn from any local"nebraska lawyers"
Each per lawyer LIED to her in Nebraska, to other states she called for a lawyer to represent Tiffany... They all told her, (as she discussed 1-on-1 during her POWER session call in session with our owner S.Bella Melendez, she cites that when she REALIZE NEBRASKA DHHS has hurt her, harmed her, tried to illegally/unlawfully TERMINATE her rights as a parent,she said how she called at least 20 lawyers, and all had lied to her saying,"Oh you can't sue a DHHS worker." what WE KNOW and what the owner here, S.Melendez ext. 806 HAD SUCCESSFULLY prior, ALREADY PROVE that you sure are able to timely by DEADLINE (properly) sue by pro-se method, DHHS. To finally be able to commence and get her suit filed pro-se against NEBRASKA DHHS . BEFORE DEADLINE. TIFFANY finally found some one, who truly WON and who truly CARES. We are proud of her,for never giving up and getting off line and filing her suit in due course." Has Nebraska DHHS abhorrent workers continually deprive you such right? law,right and make a reasonable effort to see to it child is return and or not remove? Has Nevada DHS lied and is leaving your child,daughter,son,niece nephew in direct harm's way? Until W.O.N. network e-law student EXPERTISE WINNING EFFECTIVE network, so many worldwide being violated had no clue on where to go;how to sue without a lawyer CPS,within the time allotted to seek money damage(s)known as PRO-SE SELF FILE per CPS worker violating one's U.S.Constitutional/Civil Rights. Ask for heather-marie ext. 102 or ext. 260(bella) to begin at once.No Delay.Swift astute,aggressive diligence-applied,when your ready to file your suit. Timely...Against abhorrent Child Protection Service caseworker,supervisory/managerial violating one's right.www.Facebook.com/SUECPSByDeadline Fill out our convienient help-form,or your call will NOT be transferred to ext.102 to begin same-day. Thank you. Kids have rights.Simple as that. Rights terminated? You're able to prove your right to child was terminated, premise on a illegal removal/continual unlawful removal, and false information utilize to wrongfully and illegally terminate right to child et.al., 1-929-277-7848 Do not wait,as others have done until your time run out to sue pro-se(self file) just because a lawyer do not care about you at all, or enough to "listen" and to "file/represent you." ​Do it on your own,and smile while doing so,knowing at least you're trying your hardest to see to it,the worker who has engaged in such illegalities to see your rights are terminated,is finally in a court of law(federal court)IS BEING HELD ACCOUNTABLE for harming you,your family,premise on DHHS in Nebraska child protection services violation of one's constitutional right."